The Perfect Darned Home series examines the search and desire for perfection in our everyday lives by peeling away the walls of idealized domesticity to expose wild landscapes and uncharted depths. I combine people in beautifully designed minimalist homes from interior design magazines and books with stock photos of landscapes. I cut the people with their furniture away from walls and their homes, deliberately leaving blurred and awkward edges. 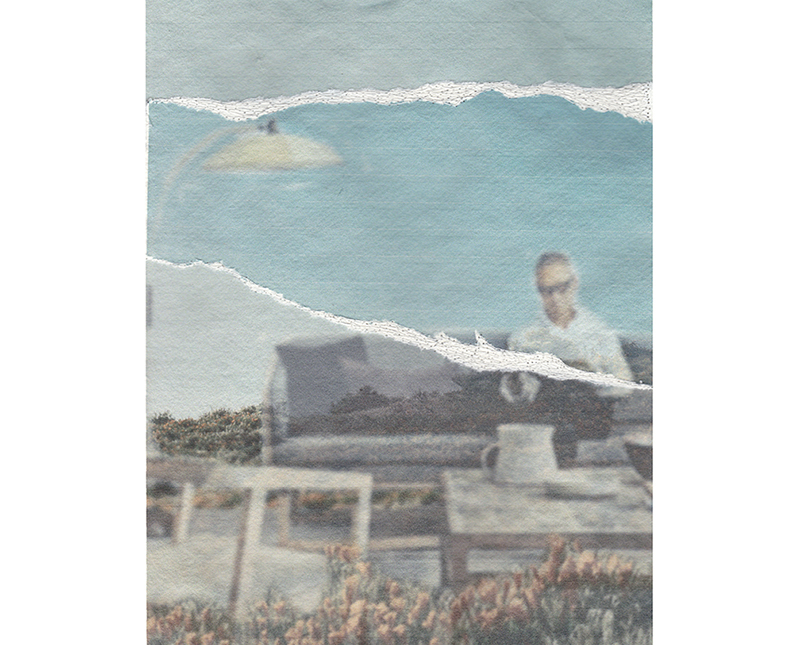 I then scan and digitally layer the people and their personal objects into the landscape to consciously contrast the tightly controlled interiors with the un-curated environments. I print the images on different textured papers, blurring some layers and leaving others focused. The layers are torn, burned, and then sewn together to show that the perfect anything is self-constructed and self-imposed. The needle also tears holes in the paper but by going repeatedly back and forth the paper and image is repaired and held back together (darned) by the thread. The titles for each work are advice from people suffering from depression about the tiny things they do to keep depression at bay. "Immerse yourself in another world by reading a book"
"Think about getting an animal companion"
"Drink water whenever you get the chance"